Dressing for work may not seem like a simple feat when we want to be stylish or fashionable while adhering to dress code. Sometimes it may be tempting to show off that cute new mini skirt you bought over the weekend to your co-workers, but a professional workplace/office is just not the place for that. I'm not saying that I have never made inappropriate work outfit decisions, but I learned from the hiccups & they're (hopefully) in the past. And this doesn't mean that I started to wear dress pants and turtle necks to work every day either. 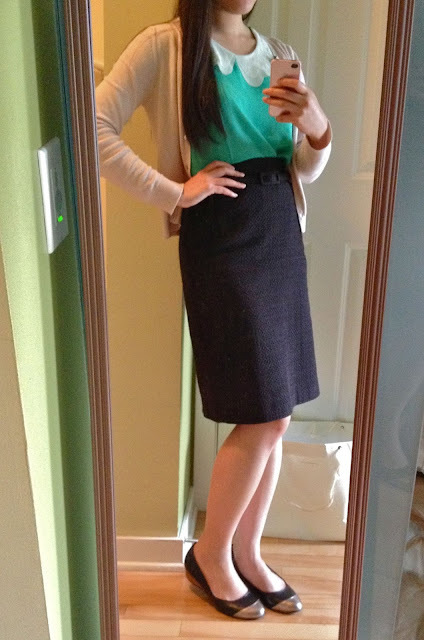 Dressing appropriately for work can be stylish and fun. And I hope this short series will make it easier for you to put together cute outfits for work! A couple weeks ago, I put together these work appropriate looks for Chicago's crisp fall days. I'll post a few looks each day this week with some of my favorite styling and shopping tips. Tip #1: Pair a colorful, embellished top, like these ruffle collared tops, with a simple warm neutral pencil skirt. 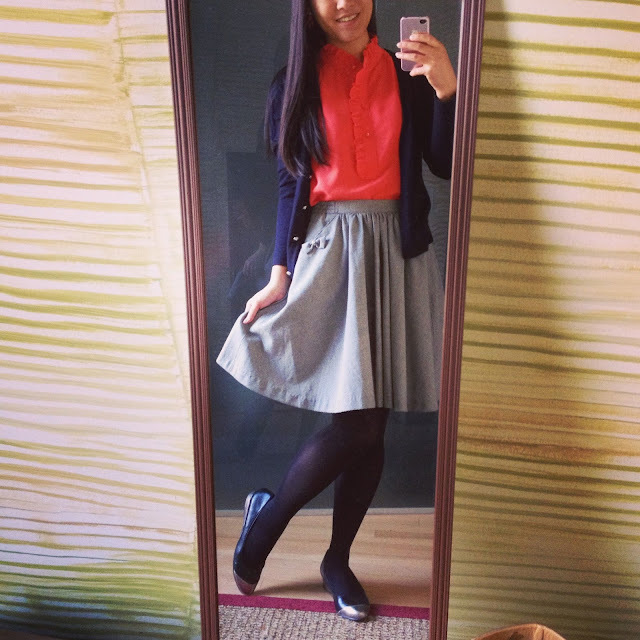 Fight the chill with a simple cardigan and add neutral colored tights if it's too cold for bare legs! Now go have fun creating work appropriate looks with what's in your closet! I hope these looks gave you some inspiration & helpful tips. I would love to share more style advice, so leave a comment if you have any questions! I love the first outfit best; that skirt and the necklace are adorable!